Boulder Opal is found only in the arid regions of Western Queensland, Australia. This beautiful gem was first discovered in 1869 and until then this beautiful Opal had lay hidden for millions of years. 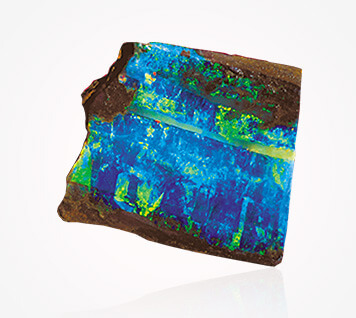 The term “boulder opal” describes the precious Opal that is found within ironstone and sandstone boulders. These boulders can range in size from a few cm to over 1m in length. Just like with other types of Opal, boulder has many different varieties, which are defined by the pattern, play of colour and the body tone. 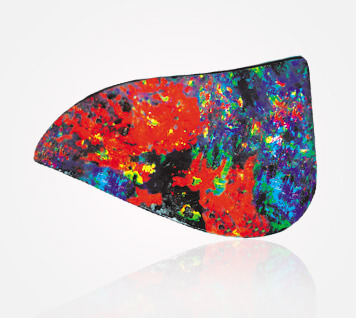 These varieties include black Opal, light Opal, matrix Opal, crystal Opal and Koroit Opal. 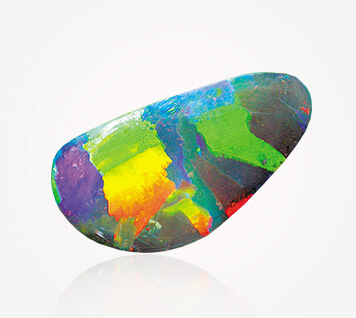 The opal itself can either be cut out of the boulder host rock, or is naturally attached as a support for its base tone and depth of colour. When the ironstone is visible on the face of the opal, this can create unreal pictures and is truly a natural work of art. The host ironstone or sandstone makes boulder Opal extremely strong and robust, perfect to wear in jewellery every day. Mining the opal in ‘boulder country’ can be quite different to mining in places such as Lightning Ridge, where the opal is not attached to the ironstone host, but found straight in the clay. In Lightning Ridge, most mining happens underground in tunnels with smaller machinery such as jack hammers. In Queensland, when mining for boulder opal, it is most common to work open cut. Since the boulders are usually large enough to see, there is no need to wash the dirt like is done in Lightning Ridge, when sorting through the clay. As the dirt is dug out of the hole, usually with an excavator, it is rummaged through, and any boulders are put to the side and broken open, hopefully to find opal inside. When mining for boulder opals underground, the boulders are usually smaller, and often you can follow whats known as trace lines in the walls of the tunnels. Every miner has their own methods when searching for opal!